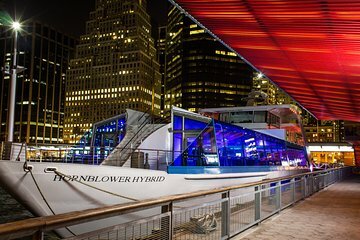 Experience a New York City party from the water on this entertaining 2.5-hour cruise along New York Harbor. See the best of the Big Apple’s iconic landmarks — like One World Trade Center’s Freedom Tower, the Empire State Building and the Statue of Liberty — while soaking up the party atmosphere of music and dancing on board. Choose from a variety of cruise options including beer and wine or an unlimited open bar. Leave the club lines and crowds behind and enjoy this exclusive night out in NYC. Mix and mingle — and depending on the type of cruise experience chosen, enjoy beer and wine or an unlimited, premium open bar. Listen to live music and dance to an award-winning onboard DJ or head to the outer deck, drink in hand, to take in the view of the city sites at night. This “Rock the Yacht” party cruise is great for fun of all kinds — as a birthday party, a bachelor or bachelorette outing, an after-party celebration or just as another excuse to get out and about. Great view of the New York Skyline at night and the statue of Liberty whilst also partying music and great atmosphere. Great views from the boat made it and amazing cruise. The staff we experienced was very friendly and courteous. Again, the views made the trip worth while for sure. We got the tour only and it was perfect for us. We drank vino and beers only on this trip. My only suggestion would be to mix up the music a bit. Booty bouncing top 40 hip hop is great but it filled 95 of the time on the cruise. Perhaps a little diversity in music and to play more to everyone on the cruise would have been ideal. It's a cruise of New York City!!! The mecca for diversity right??!! Oldies, mixing in some rock and roll and 80's/90's would have been amazing. We pay attention and pay attention to great service we ended up only tipping the bar staff not the DJ unfortunately. Other than hearing the same thumping coming from the sub woofer from start to finish, we managed to escape to the outside the see some great views in the crispy air!! Again, what views. It would have been nice to know what we were looking at during the cruise but we just used our GPS on our phones and figured it out. Wish we could have plugged in my Pandora but I digress.......!! Hahaha! Again, good trip for most, great for gatherings for top 40 club hoppers and anyone that doesn't care about music but wants to enjoy more of the sights on the outer decks. I bet it's a blast during the warmer months for sure but the crisp air made it lively and a reason to cuddle on the lower decks. Maybe the DJ can mix it up just a bit more and he tour can attract more in clients and tips during the cooler seasons!! Just sayin'. So fun and good music too! We bought a package that included open bar, food, and getting on the boat. Once we got on the cruise we find out we cant eat, that they no longer accepting that packet from the 3rd party vendor, that you have the wrong information, also we were told that the cruise was 3 hours long, to then be told its only 2 hours. I called Viator to let you guys know what happen, was told you would get back to me, only to get an e-mail saying I needed to put this in writing and send it to them, thats the only way for you to consider this. We had a party of 9 people.